In medium bowl, beat milk and pudding mix with wire whisk 2 minutes. Stir in orange peel. Let stand 5 minutes. In 3 1/2-quart trifle bowl, place half of cake cubes. Drizzle with 1 tablespoon of the liqueur. Spoon 1 cup of the pudding over cake. Layer with pineapple, kiwifruit and remaining cake cubes. Drizzle with remaining 1 tablespoon liqueur. Spoon remaining pudding over cake. Layer with mango and strawberries. Cover; refrigerate at least 4 hours. Sprinkle coconut in ungreased heavy skillet. Cook over medium-low heat 6 to 10 minutes, stirring frequently until browning begins, then stirring constantly until light brown. Cool completely; cover and set aside. 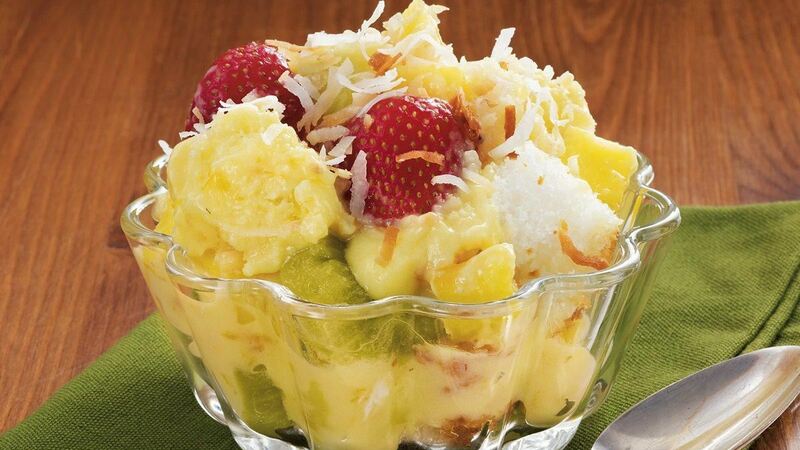 Just before serving, sprinkle trifle with toasted coconut. Spoon down to bottom of dish to scoop out servings.